Well, set those aspirations aside. Let’s refocus your resolution energy on improving your lake, pond or water garden instead. Here’s how to formulate some attainable goals—and actually reach them—when spring arrives. First of all, realistically assess the situation in your pond and your experiences with it over the past year. What problems or challenges did you face? Did you have an out-of-control algae problem last spring? A fish population boom (or bust)? Wild water temperature fluctuations? Are you sick of looking at all the cattails? As you’re brainstorming, make a list of these potential pond projects. Be as detailed as possible about what the problems were and the circumstances surrounding them. With your list in hand, identify the problem (or problems) you’d like to fix—but pick only one or two to tackle. Then, research the topic(s) to get to the root of the situation and find out what’s causing the problem. For instance, if you had crazy algae blooms last spring, perhaps you have excess nutrients in the water that need to be removed with a filter or broken down by beneficial bacterial. If a particular fish species is exploding in your lake, maybe you need to add some predator fish to keep the numbers in check. If your water temperatures are all over the place, aerating it could help. And if the cattails have taken over, it could be time to do some weed whacking. Next, develop a doable plan—complete with easily attainable goals so you don’t get burned out or overwhelmed. Think manageable benchmarks rather than big-picture dreams. Let’s take on algae blooms. Your action plan would include removing dead vegetation with a pond rake and weed cutter; adding beneficial bacteria, such as DefensePAC® (water gardens) or ClearPAC® (pond and lake), to break down detritus and subsurface nutrients; adding or cleaning your mechanical filtration system; and setting up an aeration system, like an Airmax® Pond Aeration System. These are all attainable goals that don’t take too much effort when they’re laid out in such a way. Finally, take action before it’s too late. No pressure here—but time is of the essence, particularly with pond resolutions. Small problems, like the occasional algae bloom, can quickly become big problems and may even threaten the health of your lake or pond inhabitants. Why wait? Before the weather warms, get a jump start to the season by identifying problems, developing action plans, and readying the tools you’ll need. Then you’ll be able to get a hold of these issues before they’re in full swing so you can enjoy the season! Pond Talk: What are your pond resolutions for the New Year? I Want To Build My Own Pond. How Do I Go About Planning It Out? There are a number of considerations that need to be made when planning for a large pond. These basic and important tips will help make sure you are on the right track and well prepared for constructing and maintaining the large pond that’s right for you. Purpose– What do you want to use your pond for? If for fishing, plan for depth and habitat. If for swimming, consider implementing a shallow beach and gradual slopes. Shape – What do you want your pond to look like? Ponds with uniform shape are often easier to care for as they typically posses less shoreline and can be circulated with less obstruction. Size – How big do your want your pond to be? 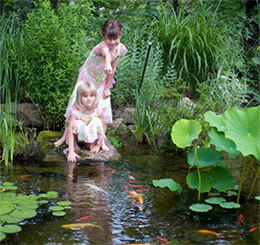 The size of your yard can play a large role in determining pond size. Purpose is an equally important factor; do you want to use your pond for swimming and skating? Surroundings – What will be around your pond? Avoid areas that introduce excessive amounts of debris. Runoff and foliage are two common contributors to pond muck. Berm the edges of your pond to prevent runoff and distance trees away from the shoreline. Depth – How deep should your pond be? A typical depth for a large pond is six to eight feet, though if you plan on stocking specific fish such as walleye you will want to increase the depth to provide adequate habitat.